The Helix Nebula (NGC 7293) is a challenging stargazing target for amateur astronomers. It is one of the closest planetary nebulas -- a type of nebula formed from gas ejected by a dying sunlike star. Yet it is so large and spread out in the sky that it appears very dim in a telescope eyepiece. Long-exposure photographs unveil the true beauty of this celestial wonder. Although named for its resemblance to a coiling spiral seen face on, the Helix Nebula has a more complex three-dimensional structure. Previous studies showed that it consists of two gaseous disks nearly perpendicular to each other. Observers on Earth view the main disk nearly face on, making it appear more ring-shaped. In addition to its overall structure, the Helix proved to be surprisingly complex even at the smallest scale visible to Spitzer. "Most planetary nebulas look diffuse and uniform through telescopes," explained Joseph Hora of the Harvard-Smithsonian Center for Astrophysics (CfA), who leads the team that took the image. "Because the Helix is so close, we can see more details of its fine structure. Spitzer shows that the Helix is clumpy at very small scales." The most striking feature of the Helix, first revealed by ground-based images, is its collection of thousands of distinct blobs that resemble comets due to their compact heads and long, streaming tails. Each "cometary knot" is much larger than an actual comet, spanning about twice the size of our solar system. Each knot holds about an Earth-mass of hydrogen and other gases that were expelled from the nebula's central star thousands of years ago. In the Spitzer image, the cometary knots show peculiar color-coding with blue-green heads and reddish tails. The bluer, more energetic radiation at the tips comes from molecular hydrogen that has been excited by ultraviolet radiation from the nebula's central star or shocked from its fast-moving stellar wind. The tails lie behind the main body of the knots and are relatively shielded. As a result, they emit redder, less energetic radiation. The Spitzer image shows a clear trend for the nebula as a whole to become redder at greater distances from the central star. The clumpy appearance extends beyond the innermost part of the nebula, although the distinct cometary features disappear. Overall, the Spitzer image displays a constantly changing region where powerful radiation from a hot stellar core is blasting outward and eroding surrounding material. Eventually, the beautiful gaseous streamers of the Helix will vanish, destroyed by the star that created them in the first place. 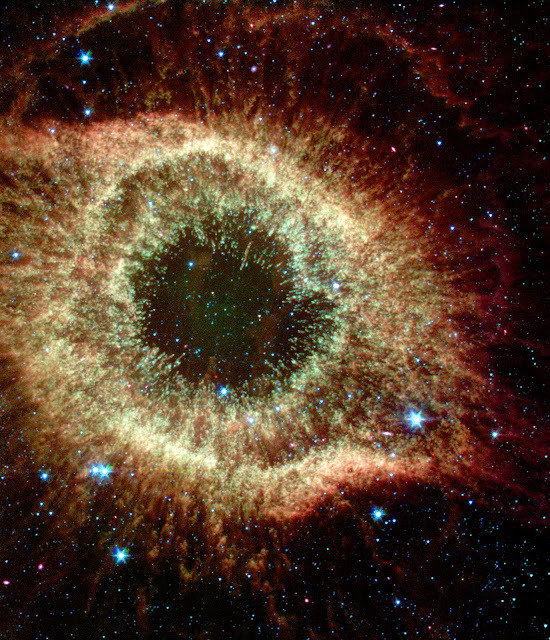 The Helix Nebula is located about 650 light-years away towards the constellation Aquarius.